I really want to be better about having more family meetings! Every time I say, “family meeting” everyone gets excited! It may be because we don’t have them all the time and they know if I call one, it must be important. My sister started having family meetings every Sunday night. They have a Bible time and pray together. They also talk about issues that their children are dealing with. She said it’s been great to hear them open up. It’s amazing that when we set aside time to talk as a family, we learn things about our children that we might have never known. For example, maybe one of them met a new friend they want to talk about, or a bully they might have encountered or maybe just a kind word will be said that will encourage another sibling. It’s about being intentional with our kids, trying to get in their heads. Asking questions and really listening to their heart. Sometimes with some of my kids, I know if I ask a question and then wait a minute, they will start to talk. With my other children, I don’t need to wait, they just start talking up a storm. All of them are so different! Start with a” kid of the week” – Each member of the family says something kind to that child during this time. Let’s keep each accountable on this. If you want to join me, let’s try to be consistent this summer. Let’s ask each other how we are doing! Let me know what you think! So far this summer we have had only one meeting, so I need to get busy planning for Sunday! 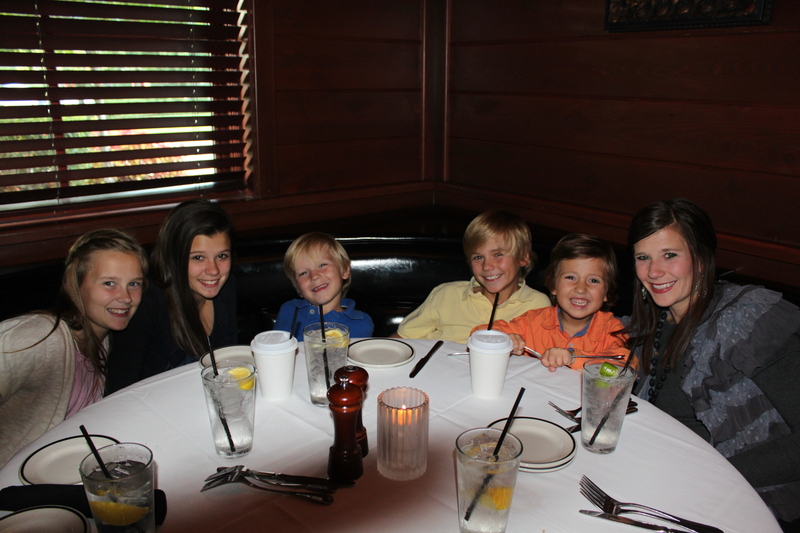 (Jeremy is missing, because he is taking the picture) We had a gift card for Stoney River and took all of the kids. I can’t wait tot do this with Juliet and our little man (he’s in the oven)once they get older. Kelly and I already have family meetings together except its a monthly financial meeting. I like the weekly meeting idea you’ve suggested. I think we’ll start doing this now so the Segway will be easier when our kids are older. Kelly and I are still amazed y’all have five precious kids!! Tell Jeremy hello! Thank you for your comment. Jeremy and I have a meeting each morning too from 6:30-7:30, I love this time. We talk about what we have that day and pray before we start getting ready to take on the day. Congrats on your sweet baby on the way. I miss those baby days. I will tell Jeremy you said Hello.